At RGB Solutions. we have an excellent and well talented team who love technology, enjoy working with people are great at what they do. They’ll turn up crisp and smart at the time agreed and call you if they are delayed. They’ll stay until the job is complete and go out of their way to work efficiently and quietly whilst you work. 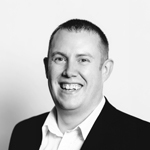 Richard started the business and is passionate about delivering an excellent service. Highly organised and great with clients he has an intuitive ability to identify client needs very quickly. A keen cyclist Richard loves doing things to the best of his ability and drives this positive message into his highly capable team. 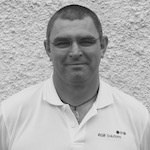 Gareth is our Technical Team Manager and is responsible for all service operations. 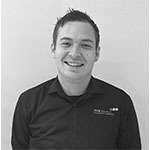 A vastly experienced and loyal member of our team, he will ensure that the service we deliver exceeds all expectations. He is a fitness fanatic and maintains his health by playing sports and regular visits to the gym. Jay Rutherford is our Support Team Leader. Experienced, talented and personable, he is able to ensure that his team provide a reliable resolve to all our clients technical issues ensuring that service is maintained at the highest available level. He loves sports and fitness and along with being a determined badminton player, he has completed various marathons for charitable causes. Clive is one of our experienced Support Technicians. 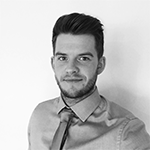 He has vast amounts of knowledge and skills which adds to our quick response and high customer service levels. He is a fan of all sports especially rugby, cricket and football. He is a lifelong supporter of the Springboks and is also fluent in Afrikaans. 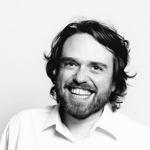 Robbie is our senior engineer – he’s our technical guru and fixes some of the most complex problems our clients give us. Many of his clients are long serving and they ask for him because of his specific technical expertise. A keen angler Robbie is the methodical member of our team! If you feel you have the skills and character required to become an integral part of Scotland’s leading IT company then post your CV and a covering letter for the attention of our Operations Manager.